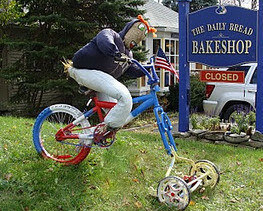 A true artisan bakery, the Daily Bread Bakeshop in Mountainhome, PA, specializes in hand made, hearth baked breads and old-fashioned, home style sweets. Everything in the shop is made from scratch from the finest ingredients. What is now the Daily Bread was originaly built in 1910 as a summer cottage for the Morrisy family. It became a gift shop as early as 1915, and has been many things since... a tea room, a candle shop, an art gallery, and a dress shop to name a few. In 2002 it was purchased by Traci & Kevin Conroy who, with their lifetime of experience in the restaurant and catering businesses, transformed the crumbling old building into the artisan bakery it is today. They are proud to bring their passion for quality to Barrett Township and the surrounding communities, and look forward to meeting you!